On 11 December 2018, the NCPO issued the Head of the NCPO Order No. 22/2561 to revoke 9 important orders, which included section 12 of the Head of the NCPO Order No. 3/2015 prohibited political gatherings. Unlock for people to take part in public activities more convenient than before, and the political parties can also start thier campaign. However, these revoked orders may be only one scene in the political stage, the NCPO remain its power to raid and visit houses or take people to the “Attitude Adjustment” Camp which the NCPO has been doing during the past four years, and the Public Assembly Act still is an obstruction of public assembly. 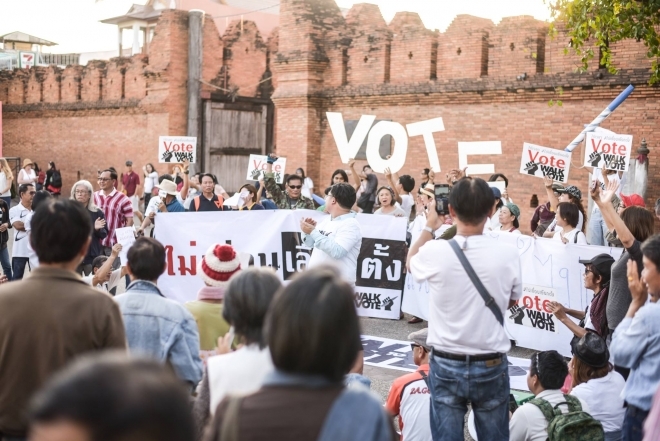 5 January 2019 “We Want Election” group gathered at Victory Monument, appealed for holding the election on 24 February as scheduled. Before the assembly, Anon Nampha, a lawyer and also the leader of “We Want Election” group, had notified Phaya Thai police station of public assembly already. There were some plainclothes took pictures and videos of demonstrators during the assembly. Before the assembly, there were more than three house visit by police officers. Phansak Srithep, the member of “Resistant Citizen” group, mentioned that public security police commanders came to treat him a cup of coffee and said that 'superior' asked him to persuade Phansak not to join the assembly. Phatnaree, mother of Srirawit, said that there were some plainclothes came to meet her son, but her son went out to the assembly at the same time. Also, Phayao Akahad said that there were polices from the security department came to meet her for preventing her to go to the assembly. At 6 o’clock in the evening, police detained Ekarat Udomamnuei, a vendor who prepared to shave his head for protesting and announced that he would go on a hunger strike until the government announced the election day, the police took him from Victory Monument to Phaya Thai police station for a talk. The police said that Ekarat Udomamnuei notified the Phaya Thai police station of holding an assembly at the midnight on January 6, at the time that Ekarat began the activity was less than 24 hours, later he then changed the place and shaved his head at Ratchaprasong Intersection on January 8. Commissioner of Ching Mai police station, Police colonel Tirasak Sripraseud, announced the summary of the notification of holding the assembly called for the election from “Walk to vote” group at Tapae Gate, Chiangmai. The summary of the document showed that the demonstrators should be careful to the action and the signs which deemed to be violation of the Head of the NCPO Order No.3/2015. All signs must be no action opposed to the duty of the government and the NCPO. Then, on January 10, the assembly was held peacefully, but there were militaries from 33th military circle set up a stage at the same time, rasing fund to support the victims of typhoon disaster in the south of Thailand, and the speaker was quite loud. Sudarat Keyuraphan, one of the leaders of Pheu Thai Party, told that since she entered Chiangrai Province for campaigning, there were men always tailed and took photos of every working places, until she had dinner with her team they still kept taking photos. Sudarat then walked to query, and the men answered that they came here to take care of their safety, when Sudarat asked that which unit did they come from, the officers said they were from “City Sector”. Sawat Homnan, PAO deputy chairman of Phayao, signed a letter to cancel the permission to use the sport stadium of Pairoj Tanbanjong, an MP candidate of Pheu Thai Party. According to the letter, before this incident, the PAO of Phayao had allowed Pairoj Tanbanjong and the Pheu Thai Party to use the sport stadium to hold a speech. 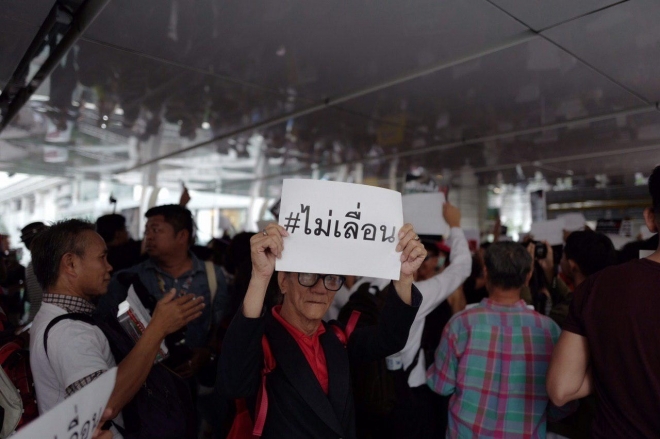 However, after they discussed again, the PAO thought that the use of government facilities to do political activity would give the Pheu Thai Party an advantage over other political parties, the PAO then withdrew the permission to use the stadium. Sudarat Keyuraphan, one of the leaders of Pheu Thai Party, said that the 'great authority person' in Bangkok required the highest officer of the province to ban her for giving the speech definitely. The Facebook page “ Research and Law Development Center, Faculty of Law, Chiangmai University” wrote a post to announce that they were going to show the banner of “Want Election” at 11:11, Faculty of Law, Chiangmai University. Later, there were policemen came to ask about hanging the banner. However, when people asked that “Hanging the banner was a violation to which law?” the police couldn’t answer then went back. About 15:40, the Facebook page posted again and said, “Urgent! People who didn’t take photos with the banner “Want Election” yet, please hurry! The officers were interfering us to take off the banner”. When asking the organizer, he said that the executive board of Chiangmai University contacted through the Faculty of Law, asking to take off the banner. However, the organizer asked the executives to contact him directly, but there was still no contact from the executives, the organizer confirmed that they would not take off the banner. Prasitchai Nunuan, one of the leaders who opposed to the coal power plant, wrote a post that a colonel made a phone call to him to talk about the announcement that Prasitchai would gather in Bangkok on January 25 to oppose the dam in southern Thailand. After finishing the phone call, the colonel asked to visit his home to talk again. Prasitchai told that the military had visited his home in Phattalung many times, met his mother and made her feel afraid, his mother then begged him not to conduct the activity which he planned to. Matichon reported that Jumphita Jantarakajon, the MP candidate of the fifth district, Nakhon Pathom Province of Future Forward Party, said that after she announced publicly and everyone knew that she was the candidate of this anti-NCPO Party, there were police from Phokaeu Police station came to meet her at home in November 2018. The police told her that they received an order from the senior officer of the seventh provincial police, asked him to come to coordinate, facilitate and take care of the security, and also asked about her background and family members. Recently, there were three provincial policemen with Special Operation from Nakhon Pathom Province, came to say that they had received an assignment to facilitate, take care of her security and also asked about her background like last time. Although Jumphita Jantarakajon told the police that she had explained the information already, but the police said that they were from a different unit, so they wanted to get the new information. Furthermore, the police also brought an interview form, the form indicated that they needed a full face photo, name, cell phone number, address, the political party which she belonged, political experience, people who supported her, the name of canvassers, etc. Jumphita Jantarakajon asked the Election Commission, the NCOP Government or resposible authurities that was there any policy to assign government officers to collect the information of MP candidates or not? Did they execute to every political parties, every districts or only done to her who was the candidate of the Future Forward Party? And if they didn’t execute to every politicians could she consider this as intimidation?